First published in 1932, this book discusses the suspension of the gold standard in Britain, and the economic events surrounding September 1931. 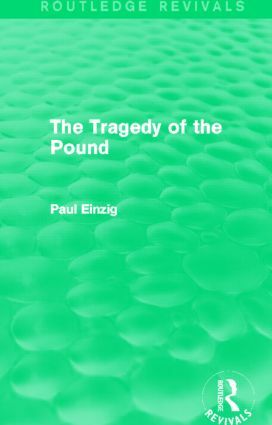 It argues that despite specific errors made by individuals, groups, and individual nations, the attempts to save the pound had little chance of recovery. Indeed, years before its collapse, powerful, fundamental factors had been eroding its stability. Hence, the author does not entirely blame the influence of French policy, or Great Britain’s political and economic decline after the war, but states that the collapse of sterling was co-ordinated by several factors of importance.